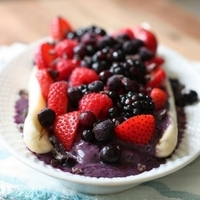 Recipe by Denise Barratt, Vine Ripe Nutrition. Toasted coconut, chia seeds and extra mango and blueberries to thread on a skewer . You may also want to have on hand some colorful paper straws! In a small cast iron skillet over medium heat, carefully brown the coconut, stirring constantly but do not burn. Make sure that it is soft to touch but not overripe. Carefully peel the fruit and cut the flesh on cutting board as close to the seed as you can. Then cut the flesh away from the other side of of the seed. There is flesh at the top and the bottom of the seed. Carefully cut the rest of flesh away from the seed and what is left is mostly the large flat seed. 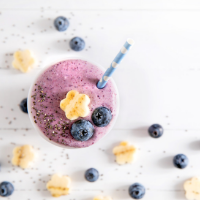 In a blender, add chopped banana, chopped mango, wild blueberries and coconut milk. 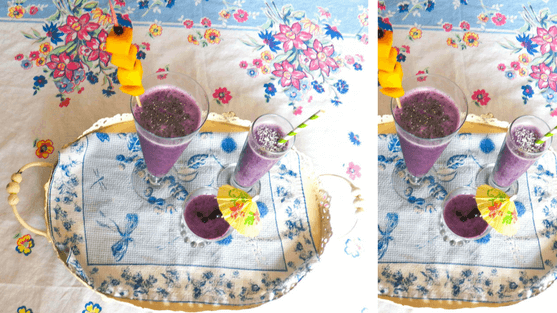 Blend the ingredients until blended and add to glasses.